Explaining in clear terms some of the main methodological approaches to legal research, the chapters in this edited collection are written by specialists in their fields, researching in a variety of jurisdictions. Covering a range of topics from Feminist Approaches to Law and Economics, each contributor addresses the topic of ‘lay decision makers in the legal system’ from their particular methodological perspective, explaining how they would approach the issue and discussing the suitability of their particular method. This focus on one main topic allows the reader to draw comparisons between methods with relative ease. 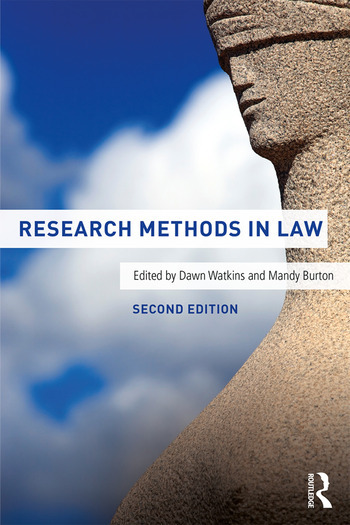 The broad range of contributors makes Research Methods in Law well suited to an international audience, and it is ideal reading for PhD students in law, undergraduate dissertation students in law, LL.M Research students and early year researchers. Dawn Watkins is an Associate Professor of Law at the University of Leicester. Mandy Burton is Professor of Socio-Legal Studies at the University of Leicester.